Below, I managed to take a lot of photos but even though I was there at 11:30am, I was knackered by 5:30pm and as I carried my Louvered steel Deck lid for our Model A roadster to my Van, I was so tired but worth the 11,000 steps I took, I didnt get to see it all as well, a first for me, but this show was way bigger this year than any I could remember – I have been to everyone since 2000. So check below at my photo album, there may be a ride that you like? So many to choose from. Check out my page on FB. The Grand National Roadster Show in Pomona is billed as the biggest roadster show in the U.S. It’s where classic roadsters will compete for the award America’s Most Beautiful Roadster. But what is a “roadster,” exactly? “It’s a pre-1937 car with a removable roof and no side glass,” said John Buck, the owner and producer of the Grand National Roadster Show. But that’s just the beginning. The 14 cars competing for the 9-foot tall perpetual AMBR trophy are hand-crafted, custom-designed rolling works of art which take thousands of hours to build. Some legendary names are on the trophy, which will be presented to the next winner on Sunday. Previous honorees have included George Barris, who started building custom cars back in the 1950s, before turning his attention to creating movie and TV cars like the famous Batmobile. A panel of experienced judges will decide this year’s winner. The huge trophy – and the entries – are on display in Building 4 at the Pomona Fairplex through Sunday. What if you like cars but roadsters aren’t your thing? That’s OK, they’ve got every kind of custom car spread throughout the Fairplex. If it’s got wheels and is customized, it’s probably here. With the cars in the buildings, and the ones that’ll be parked on the surrounding grounds, over 1,500 cars in total are expected. “We’ve got muscle cars, we’ve got custom cars, we’ve got low-riders, we’ve got trucks, and we’ve got great amount of Volkswagens over in our club room,” noted Buck. Many of the highlighted cars are stars of the custom-car world, having appeared on magazine covers, in articles, in advertising, and in movies and television shows. And sometimes, the people who design and build the cars become stars themselves. For example, Chip Foose has become a household name thanks to appearing in the reality TV series, “Overhaulin,” among other programs. And since he’s won the AMBR trophy in the past and has created so many legendary cars, show organizers this year decided to name Foose the event’s “Builder of the Decade” for 2019. Gathered in Building 7 at the Fairplex are 12 of Foose’s creations from over the years, together for the first time in one place. “I said ‘Fantastic, I’d love to do. Let me make some phone calls.’ I called the customers and they all said ‘Yeah, we’d love to be part of this’,” said a busy Chip Foose, interviewed between posing for pictures and signing autographs. This show has always featured cool cars, and some legendary car people. And year after year, the GNRS has had a charitable aspect to it as well. In the main hall, professional pinstripers will be doing their art for various charitable causes. Hand them a phone, a handbag, or anything else you can carry into the show, and they’ll add custom pinstripes to it, just like the ones seen on custom cars for decades. Also this year, the show is helping “Drive Toward a Cure,” to benefit Parkinson’s Disease research, in conjunction with the Michael J. Fox Foundation. Right near the pinstripers, you can buy a raffle ticket for a one-of-a-kind B.R.M timepiece that salutes the original Ford Mustang from “Bullitt.” Each ticket is $25, and the watch will contain a fleck of paint taken from the Mustang that Steve McQueen once drove. While you’re there, you can snap a selfie with the tattered green Ford which is on display to highlight the charity. 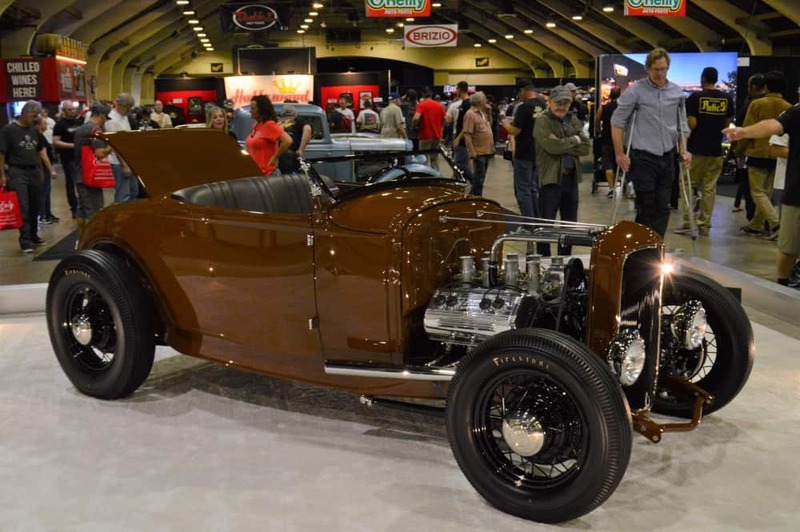 This entry was posted in Blog and tagged AMBR, Barris, big block, Cal Custom, coupe, dry lakes, Edelbrock, Evans, flathead, GNRS, grand national roadster show, hot rod, Iskendarian, Kelsey, roadster, sbc, SBF, sedan, Sharp, small block, stromberg, tattersfield, Thickston, tudor.